One of the best example for Intercepting Filter Pattern is Spring Security's DelegatingFilterProxy , which will intercept the HTTP request and do the authentication check. Spring security build on chain of filters. Let's see how the Intercepting Filter Pattern solve the problem with examples. This pattern is divided into a number of sections for simplicity like problem, forces,solution,implementation etc. Do we support the browser type of the client? Some of these checks are tests, resulting in a yes or no answer that determines whether processing will continue. Other checks manipulate the incoming data stream into a form suitable for processing. You want to intercept and manipulate a request and a response before and after the request is processed. You want centralized, common processing across requests, such as checking the data-encoding scheme of each request, logging information about each request, or compressing an outgoing response. You want pre and postprocessing components loosely coupled with core request-handling services to facilitate unobtrusive addition and removal. You want pre and postprocessing components independent of each other and self contained to facilitate reuse. Use an Intercepting Filter as a pluggable filter to pre and postprocess requests and responses. A filter manager combines loosely coupled filters in a chain, delegating control to the appropriate filter. In this way, you can add, remove, and combine these filters in various ways without changing existing code. Step 1 : Create Filter interface. Step 2 : Create concrete filters - AuthenticationFilter, DebugFilter. Step 3 : Create Target. Step 4 : Create FilterChain. Step 5 : Create FilterManager. Step 6 : Create Client. Step 7 : Use the Client to demonstrate Intercepting Filter Design Pattern. Step 8 : Verify the output. 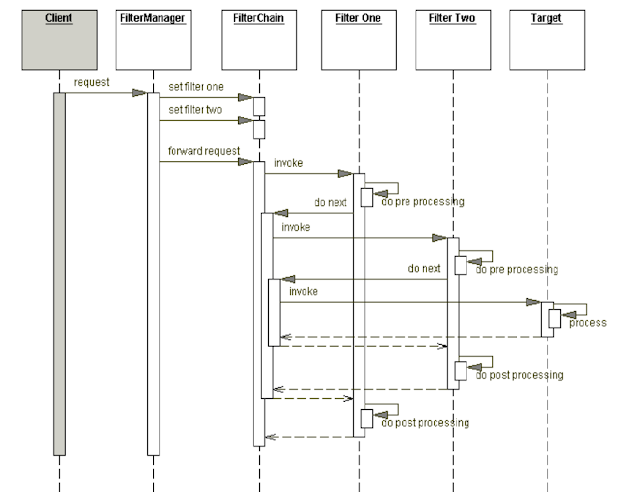 The servlet 2.3 specification includes a standard mechanism for building filter chains and unobtrusively adding and removing filters from those chains. Filters are built around interfaces, and added or removed in a declarative manner by modifying the deployment descriptor for a Web application. A filter is an object that performs filtering tasks on either the request to a resource (a servlet or static content), or on the response from a resource, or both. Filters perform filtering in the doFilter method. Filters use the FilterChain to invoke the next filter in the chain, or if the calling filter is the last filter in the chain, to invoke the resource at the end of the chain. Our example for this strategy will be to create a filter that preprocesses requests of any encoding type such that each request may be handled similarly in our core request handling code. Why might this be necessary? HTML forms that include a file upload use a different encoding type than that of most forms. Thus, form data that accompanies the upload is not available via simplegetParameter()invocations. So, we create two filters that preprocess requests, translating all encoding types into a single consistent format. The format we choose is to have all form data available as request attributes.